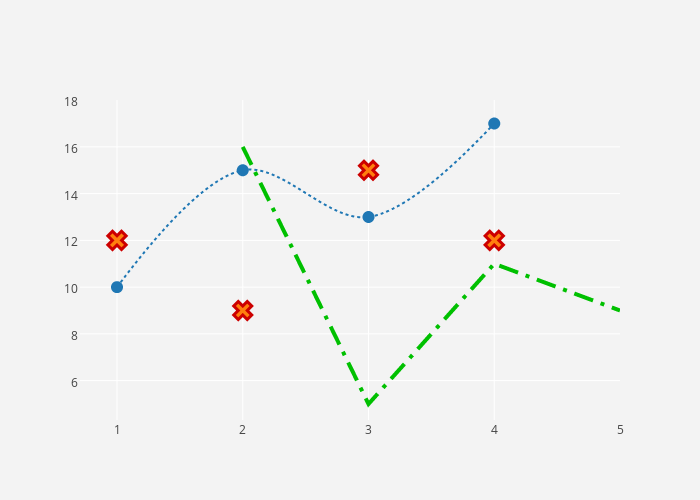 Follow along below to make a mixed line and scatter plot in Chart Studio. Select “Line plot” from the MAKE A PLOT menu. Your plot should look something like this. All the traces are line plots with markers. The first step to styling it into the mixed-type graph above is to open the TRACES popover in the toolbar. Here’s how the “Mode” tab of the TRACES popover for “trace 0” should look. Here’s how the “Mode” tab of the TRACES popover for “trace 1” should look. Notice that we’ve selected the marker without a line option -- this is how you get a scatter plot. Here’s how the “Mode” tab of the TRACES popover for “trace 2” should look. Notice that we’ve selected the line without marker option. Now your plot should look something like this: a mixed line and scatter plot. We still have some styling to do to get the plot at the top of this tutorial! Open TRACES again. This is how the “Style” tab of the TRACES popover on “trace 0” should look. We’ve smoothed the line, changed the stroke, and made the markers larger. This is how the “Style” tab of the TRACES popover on “trace 1” should look. We’ve changed the stroke and its weight. This is how the “Style” tab of the TRACES popover on “trace 2” should look. We’ve changed the shape of the marker and its outline. This is how the LAYOUT popover should look. We’re giving the plot a grey background. We’re hiding our legend in the LEGEND popover. You can download your finished Chart Studio graph to embed in your Excel workbook. We also recommend including the Chart Studio link to the graph inside your Excel workbook for easy access to the interactive Chart Studio version. Get the link to your graph by clicking the blue "Share" button. Download an image of your Chart Studio graph by clicking DOWNLOAD on the toolbar. Your finished chart should look something like this. To add the Excel file to your workbook, click where you want to insert the picture inside Excel. On the INSERT tab inside Excel, in theILLUSTRATIONS group, click PICTURE. Locate the Chart Studio graph image that you downloaded and then double-click it. Notice that we also copy-pasted the Chart Studio graph link in a cell for easy access to the interactive Chart Studio version.